A dish that originated in Indonesia and found its way across borders, rendang has been adopted by Malaysia as one of its most iconic and beloved dishes. Rendang is marinated meat slow-cooked in coconut milk and spices. The seasoning is applied in various stages -- first, during the marinating and several times during cooking. The number of spices and seasonings used is so numerous that the cooked dish has a richly complex taste that is spicy, tangy and sweet all at the same time. Rendang can be cooked as a stew but the more traditional rendang is cooked beyond the stew stage (wet rendang) where the meat is fried in rendered fat after the coconut milk has been absorbed (dry rendang). I've never cooked dry rendang because my family likes to spoon the sauce over rice. 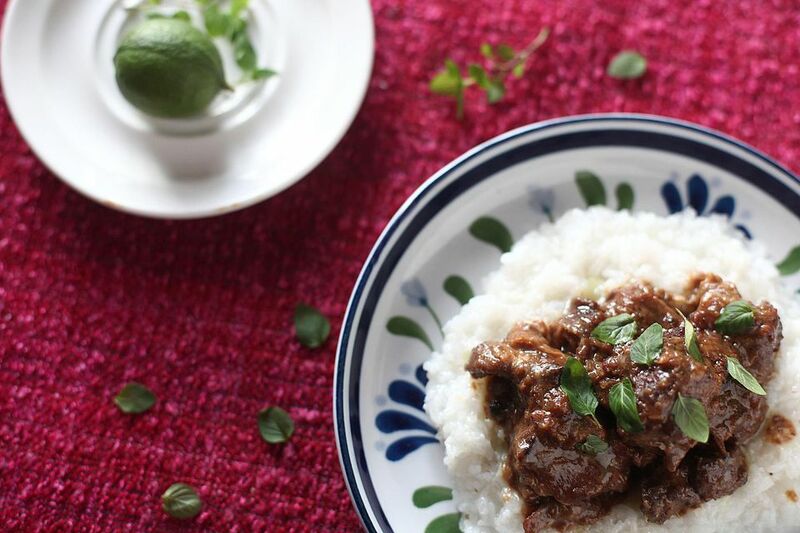 This recipe is for wet rendang. Most of the spices are available in Asian stores, including crushed galangal and tamarind paste. If fresh turmeric is not available, substitute about a tablespoonful of turmeric powder. Toast the coriander seeds and black peppercorns in an oil-free pan until fragrant. Place the coriander seeds, peppercorns, galangal, garlic, chilies, shallots, turmeric, cumin, and nutmeg in the blender or food processor. Process to make a thick paste. If using a blender, you may need to add a couple of tablespoonfuls of water to help the motor to run. Place the beef in a shallow bowl. Pour in the spice paste. Mix thoroughly to ensure that each piece is completely coated with the spice paste. Cover the bowl and put in the fridge for at least an hour. Toast the grated (or desiccated) coconut in an oil-free pan until lightly browned. Set aside. Heat the cooking oil in a wok or pot with a thick bottom. Saute the onion, lamongrass, cinnamon sticks and kaffir lime leaf. Add the beef with the marinade and cook over high heat, stirring occasionally, until the mixture looks dry. Pour in the coconut milk, tamarind paste, palm sugar and about two tablespoons of fish sauce. Stir. Bring to a gentle boil, lower the heat, cover and slow cook the beef for two to three hours or until very tender and the sauce is thickened and considerably reduced. It is important to stir and scrape the bottom of the pan occasionally to make sure that the spices do not stick to the bottom. It is also very important to taste every once in a while and adjust the seasonings, if necessary. Is Ox Tongue The Same As Beef Tongue?